Despite the buzz it has created, Megabus gets a low grade for one of my least pleasant trips of the year. The worldwide bus company offers eye-poppingly low fares. One way fares between Albany, New York and New York City ranged from $13 and $19, when I traveled last week. That is not the $1.50 suggested in the company’s advertising but is excellent value for traveling over 150 miles one way. It appears these are online only fares. Yet, ordering online with Megabus is easy. Further, when I could not find my reservation in my e-mail, the woman at the company’s call center found it for me. She was friendly, efficient and was working in the United States. The other Megabus staff, drivers and staff at the stops are also generally friendly and efficient. Low fares make Megabus popular and crowded. On my trip, the bus was either full or nearly full. At the Megabus stop in the City, on 10th Avenue between 40th and 41st Street, there were long, but orderly and good-natured lines of people heading for New England and for Pennsylvania. The Megabus Albany to New York City run is not between traditional bus terminals. In Albany, the bus stop is at two small shelters at the north end of an open parking lot by the Albany-Rensselaer train station and the stop on 10th Avenue is on the street. If it was raining or snowing the City stop would not be comfortable. The reason I give the service a low grade is that the company appears to have overbooked my trip. When my bus from New York City stopped in Ridgewood, New Jersey, there were three passengers trying to board and only two seats vacant. The driver directed a college-aged young woman to leave the bus because of no seats. She appeared to have a reservation from an online purchase and it was not certain what the company was going to do to make things right for her trip. This situation was not just a problem for the passenger who could not travel. The bus driver was enforcing safety rules by not allowing the young woman to ride but the circumstances made him look like an ogre. While he and the passenger debated, the bus was not moving, passengers were squirming in the uncomfortable seats and the bus was delayed. 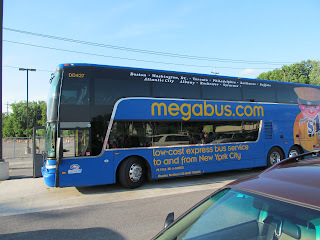 Several friends find Megabus fares, its routes and travel times irresistible and it certainly had a schedule that worked for me. But if you travel by Megabus, please . . . show up early, so you get the seat you paid for!